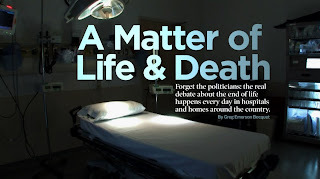 This is the tagline from an online feature about end of life care, palliative care, and the health care debate that a reader (utzgrrl) recently mentioned in a comment. I thought it was worth its own post. I’d never run across FLYP before but it appears to be an online, multi-media heavy (text, images, videos – make sure you look at this on a computer with speakers, that can handle streaming videos) general magazine. This article is overall balanced, sane, and positive about palliative care, and among other things tries to actually describe how these decisions actually happen. You can click around and listen to interviews with patients/families, docs (including some palliative care ones), ethicists, etc. A refreshing representation of what we actually do, overall, and how these decisions actually get made - what patients and families go through, etc. Thanks utzgrrl.